One of the most important elements of a good landscape design is the ability to properly drain water. Without proper drainage, you can end up with a series of potentially costly problems. Drainage issues can become a serious issue during the winter as well. This is because the snow that has collected on your property will eventually melt into water. If spring rolls around and there’s standing water all over your yard, then you know that you have a drainage problem. It’s why you should address any drainage issues you might have during the fall season. Erosion – Erosion damages the health of your soil as it washes away many of the important nutrients that it needs. You can tell if you have an erosion problem if you see exposed roots, swampy sections, or gutted out areas in your lawn. Foundation problems – Water that collects near the foundation of your home can end up causing serious damage, including not just leaks in your home foundation, but cracks as well. If you don’t address this issue right away, the foundation is going to experience more and more damage and become more vulnerable, to the point where expensive foundation repairs will be needed. Water leaks – If there’s water leaking into your basement, it shouldn’t be too difficult to tell, especially if there are water stains as a result. If this is occurring, it means that water is pooling up around the foundation of your home. 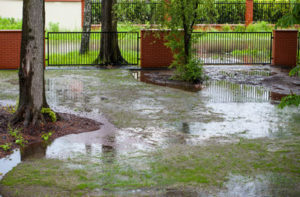 Puddles and wet spots – If, after it rains, you notice puddles or wet spots throughout your yard that take much longer to dry up then other areas, it means you have a drainage problem. Puddles and wet spots may not seem like a big deal (your yard needs water, after all); however, too much water can drown your grass and plants. Constantly running sump pump – Sump pumps help to remove water from your basement in the event of flooding. If your sump pump is constantly at work, it means that water could be entering your basement regularly as a result of poor drainage. Inadequate yard pitch or slope – If the property on which your home was built has a pitch or slope that’s too steep, it will result in water running down to the bottom area, where it is likely to collect. If your property slopes down to your foundation, you could have serious issues in the form of foundation leaks and damage. Landscape depression – If there are depressions in your landscape, rainwater is likely to collect here, causing standing puddles or soggy areas that take much longer to dry up. Impacted soil – If your soil is too impacted, then rainwater or melted snow won’t be as easily absorbed by the soil and it will just sit on top of it. A sidewalk that dams water – The sidewalk surrounding the house can be problematic to the space between the sidewalk and the home’s foundation. This is because the sidewalk can effectively work as a dam by retaining the water in that area. A lack of downspouts – Downspouts are needed to divert rainwater away from your house. If not enough downspouts are installed, this can result in rainwater collecting in certain areas. Sometimes, downspouts may be improperly installed, in which case they may be diverting rain towards your house instead of away from it. Add mulch – Mulch can help to prevent erosion as well as prevent water from puddling up. Adding mulch around your plants can, therefore, help protect them from drowning. Grading – Grading around your home can provide another place for water to flow to, thereby ensuring that a steep pitch or slope won’t cause water to build up around your foundation. Install creek beds – Creek beds provide water with a place to go and will move it to the surface of your yard. Creek beds can also add another feature to your yard that could improve its curb appeal to boot! Improve downspouts – Downspouts help prevent rainwater from falling off the roof and down to the ground around your foundation. These are just a few potential solutions. You’ll want to have your landscape properly inspected by a professional landscaper to determine what types of solutions will most successfully address your specific drainage problems. As you can see, poor drainage can cause all kinds of problems throughout your landscape. If you notice signs of poor drainage, you’ll want to have the issue addressed in the fall before it begins to snow. Once it begins snowing, it will become difficult to pinpoint where your drainage issues lie, much less to fix them. If you do have poor drainage, your landscape is likely to experience all kinds of damage following winter, when the snow finally melts away. Depending on the extent of your drainage problems, you could be facing some very expensive repairs.